Interpol officers in Antigua and Barbuda, Aruba, Barbados, Belize, Brazil, Curacao, Guyana, Jamaica, Saint Lucia, Saint Vincent and the Grenadines, Trinidad and Tobago, Turks and Caicos, and Venezuela took part in Operation Libertad. In a statement Monday, Interpol said more than 500 police officers in 13 countries — Antigua and Barbuda, Aruba, Barbados, Belize, Brazil, Curacao, Guyana, Jamaica, Saint Lucia, Saint Vincent and the Grenadines, Trinidad and Tobago, Turks and Caicos Islands and Venezuela — worked to arrest 22 people during Operation Libertad. Operation Libertad, which was funded by Canada, was planned for more than two-and-a-half years and carried out by Interpol's Global Task Force on Human Trafficking. The victims, which included men, women and children, were found working in night clubs, farms, mines, factories and open-air markets, according to the release. Many of those who have been identified as victims are believed to have been migrants seeking work. The rescue operation puts a spotlight on issues trafficking victims face even after they've been freed from their traffickers. What happens to foreign human trafficking victims in the United States? Sarah Paoletti, professor and director of the Transnational Legal Clinic at the University of Pennsylvania Law School, said people who fall into labor trafficking, like many of those rescued, are often trapped in a web of unending debts. And in some cases freedom from trafficking can translate into visa violation and deportation. "If you leave the person you were promised to, you go from being a migrant to being unlawfully present," Paoletti said. "You don’t earn the money back let alone making money to send to your family back home, and you end up in an even worse position." Denise Brennan, professor and chair of the department of anthropology at Georgetown and author of "Life Interrupted: Trafficking Into Forced Labor in the United States," said that the victims who are also suffering from a momentous breach of trust can also feel apprehensive of law enforcement. "You have people who are scared, whose trust is broken, who might not have clean underwear, or even know where they are. And strangers are saying, maybe not in their own language: 'Don’t worry about it. Trust me.' A lot can go wrong," Brennan said. 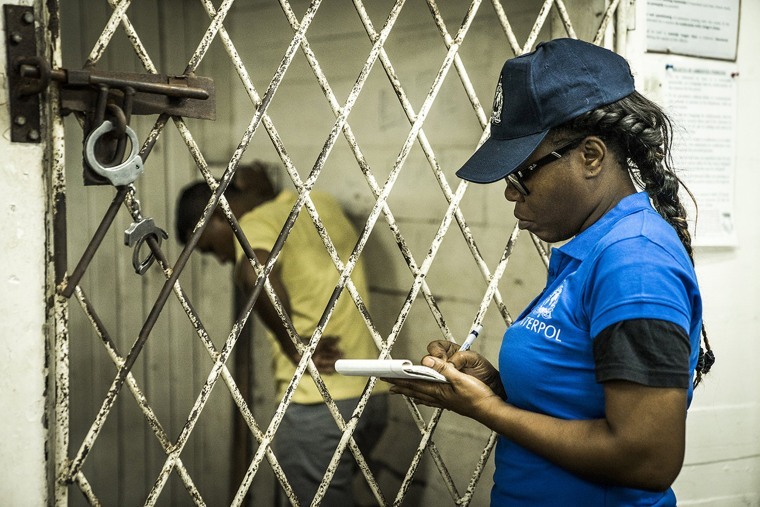 Victims rescued in the Interpol operation have been provided with social services and NGOs that have helped provide support, according to Interpol. Paoletti and Brennan stressed the victim-centered approach, which goes beyond the moment of freedom for those who have experienced human trafficking, is crucial to successfully preventing re-trafficking. "Leaving a situation of trafficking doesn’t just offer up relief. It can actually still invite a lot of fear of whats going on next," Brennan said. Many of those freed in the operation had travel documents taken from them in order for their traffickers to maintain power. In one case in Saint Vincent and the Grenadines, victims at a factory were stripped of their passports and never received wages, forcing them to depend on their handlers for housing, transport, food and the most basic necessities, according to Interpol. This woman survived being trafficked. Now she's helping others with soap. In Guyana, young women were found working as prostitutes next to extremely remote gold mines from which they could not escape, investigators said. "I was concerned when I read about the conditions of how off-the-grid those people were," Brennan said. "Those conditions can lead to employers exploiting with impunity with no one watching. It can be both a technique to abuse and intimidate." Brennan and Paoletti said that the real work for these victims often starts after they're freed. "Now the hard work begins because they're probably leaving with no documents, no money, no contacts and in many ways they’re in the hands of law enforcement or social service providers or government officials," Brennan said. "Now, after having their trust so profoundly ruptured when in a situation of trafficking, they have no choice but to trust those who are giving assistance."